Overview: The purpose of this workshop, the second in a series in the Middle East, is to provide a forum for philosophical and theological discussion, exchange, and mutual learning for Muslim and Christian scholars and junior researchers. Senior scholars will give 2-hour or 1-hour lectures on major topics, while young academics (graduate students or early career professors) will present their selected research papers in 30 minutes (20 min talks + 10 min discussions) each. The goal is for everyone, particularly the young academics, to benefit from multi-disciplinary and inter-religious perspectives and to identify new avenues of research. Complete papers (3,000–5,000 words) and abstracts (100-200 words), should be submitted (for blind review) in Word or pdf to mcworkshop@aus.edu. The body of the email should include: author’s name; title of the paper; institutional affiliation; word count. Papers will be reviewed by the workshop committee. Since we are seeking to identify new scholars, previous participants may not submit. For further information, contact Professor Kelly James Clark @ clarkell@gvsu.edu. 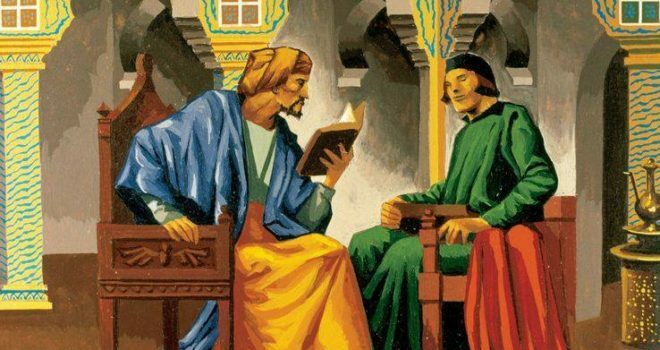 Representation of Abu al-Walid Muhammad ibn Rushd (1126-1198) (or Averroes), philosopher and Arab physician. Painting by Francisco Fonollosa.